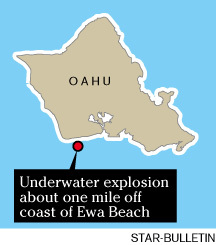 Ewa Beach resident Tim Tucker said he was fishing from his back yard with family and friends yesterday when he saw what looked like a depth charge explode out of the ocean about a mile from shore. Tucker said the water bubbled up before a huge plume of water shot about 50 to 100 feet in the air. It was followed by a large plume of black smoke, with the sound of an explosion shortly after that. "It was a definite explosion," he said. "All my neighbors heard the boom. ... One guy said he even felt his house shake. "It really looked like something from an old war movie where a depth charge goes off," he said. U.S. Coast Guard officials confirmed that an underwater explosion had taken place -- but after receiving many calls and sending rescue crews to the area. After the explosion at about 3:30 p.m., the Coast Guard broadcast a warning to mariners, notifying them a scheduled underwater detonation by the U.S. Navy had taken place and that they should not be alarmed. But residents along the Ewa coast had no idea what was going on. Some called 911 and reported that they thought the explosion was caused by an airplane or helicopter crash-landing on the water. Fire rescue crews conducted an aerial search of the area for about 90 minutes but said they found no sign of any crash. "No sign of aircraft or debris on the water or anything," Honolulu Fire Department spokesman Capt. Terry Seelig said. "We didn't find any evidence of an emergency, so we don't know what caused the explosion." The reports were so numerous that even the U.S. Coast Guard sent air and sea search teams to check out the area, just in case something else had happened that did not involve the scheduled explosion. "I called the Federal Aviation Administration, and they said there were no overdue aircraft, but we had to check it out," U.S. Coast Guard spokesman Petty Officer Michael De Nyse said. "The reports coming in were that planes were going down, helicopters going down. "We had to launch in a situation like that." De Nyse said he personally had not known about the scheduled explosion, but later confirmed it took place in a 3-square-mile area marked on nautical maps as an "explosive testing area." Despite that information, Coast Guard search and rescue crews remained in the area for about three hours until the Navy confirmed its underwater detonation. Navy officials said the explosion was part of the ongoing Rim of the Pacific naval exercises.